Back in 2004 I designed and built an ultrasonic head tracker using a Cygnal C8051F321 development kit and some custom hardware. The purpose was for use in a game pretending that the screen was a window and having a 3D environment update depending on where your head is, satisfying one of the criteria for the brain to deduce 3D data from a scene. One of the requirements was that the system had to be very cheap to build. 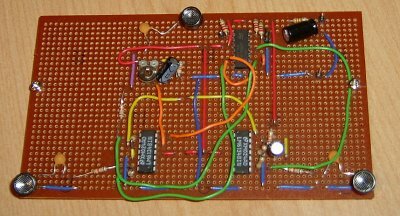 The basic design was three Op-Amps amplifying output from three Ultrasonic transducers which was fed through three comparators to create a simple one bit signal which could be sampled by any input pin on the microcontroller. The one bit conditioning was used to keep the amount of software processing to a minimum and thusly keeping the microcontroller cheap. The system worked as follows. Locate rough distance from all transducers to by sending out a pulse and waiting for a response per receiver. Send out a pulse of length 8 cycles. Given the known minimum distance from the transmitter to any of the receivers start sampling all channels simultaneously when signal is expected to arrive. Sample all receivers simultaneously for a period long enough to receive all receiver data. Analyse the resultant data and work out the phase difference between transmitted signal and received signal, using this to apply a delta to all transducer distances. Repeat, waiting an appropriate amount of time for reflected signals to have dissipated. If the signal quality isn't good enough to retrieve a phase difference then go back to step 1. The three resultant distances are sent via the USB port (endpoint 1) to the computer where a Java program communicating via a custom dll rendered the result. After completing the initial prototype I found the following issues that would need to be resolved for any commercial product. If you play music whilst using the tracker is running the tracker jitters due to the interference. A possible solution is to require the wearing of headphones. The tracker loses tracking if you move the transmitter too quickly. Can be improved by using a higher sample rate, but this conflicts with a higher degrading of the signal due to reflections and a requirement for a more powerful microcontroller. Reflections. Placing anything in the way or near parallel to the transmitted signal causes errors. This was to be expected.